Employers who create a great place to work tend to recruit and retain more top talent. How? By giving people the employee benefits they want. Find out what they are. It should go without saying that most job seekers want a quality benefits package to pair with their job offer. But which employee benefits are the most desired, and how can your company keep pace with the bigger guys? Justworks conducted an original study* to answer that question. Below, find out about the gaps between what employers offer and what prospective employees want — and the big opportunities available to growing businesses. Health benefits are usually the most expected and desired type of benefit surveyed employees cited when accepting a job offer. 88% of respondents said the quality and options of health benefits were important. However, only 41% of employers surveyed offer health insurance as part of their benefits package. Health benefits are a clear and competitive way to recruit the best talent out there. And for small businesses that are struggling to find access to affordable benefits, services like a Professional Employer Organization (PEO) can help. Although not the most important for job seekers, 26% of surveyed employees cited work perks such as gym memberships and flexible work schedules as important when considering a job offer. 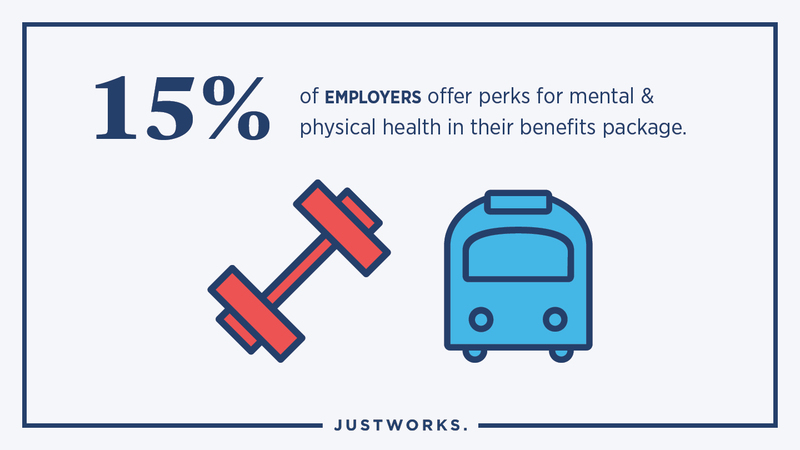 But as it turns out, only 15% of employers offer perks for physical and mental health in their benefits package. How can you bridge the gap? There are plenty of ways to infuse health and wellness initiatives into your company, no matter the size. In fact, there are dozens of those wellness ideas that won’t break the bank! We’ve made a simple guide to help you understand perks and benefits, download it now. When it comes to paid time off (PTO), job seekers highly value the ability to take time off, whether it’s for leisure or health. In total, 88% of our survey participants said vacation and paid time off are important when searching for a job. 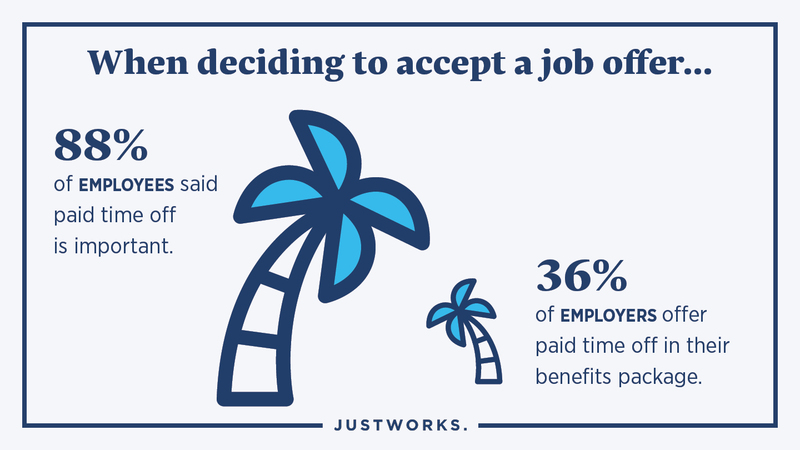 Despite that, only 36% of surveyed employers offer paid time off in their benefits package. The strain is understandable — many small employers struggle to offer employees PTO due to limited resources to cover employees while they’re gone. However, finding time for paid leave ultimately pays off, both in increased employee productivity and improve morale. When it comes to PTO, women especially value the option to take time off. 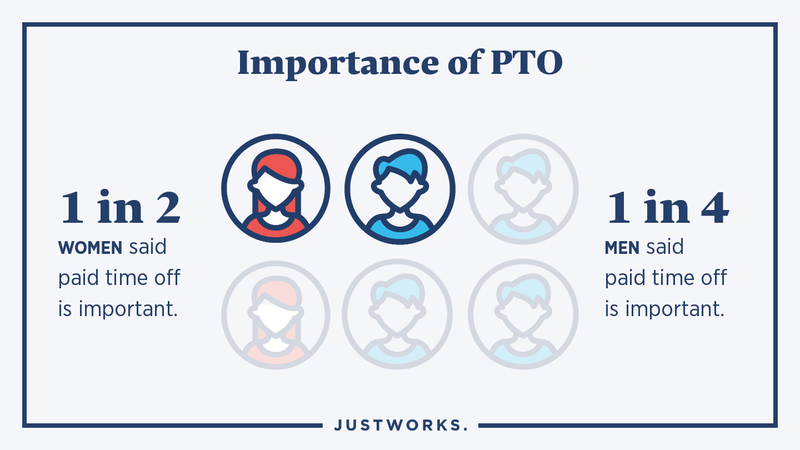 Of the respondents surveyed, 50% of women said PTO is important, while just 26% of men said the same. The need for women to use PTO may be strongly correlated with parenting. According to the Pew Research Center, 58% of working millennial moms reported that being a working mother has made it harder to get ahead at work. However, employees’ concerns about parenthood shouldn’t stop employers from recruiting the best talent for their team. Even putting paid parental leave aside, there are plenty of ways your company can create a family-friendly workplace — flexible work hours, anyone? Over the past few years, paid parental leave has grown more commonplace, originating from both independent business policies and state laws. For example, states like New York mandate paid family leave for most businesses. The trend aligns with what employees are looking for as well. When deciding to accept a job offer, 66% of employees said the employer’s paid parental leave policy is important. 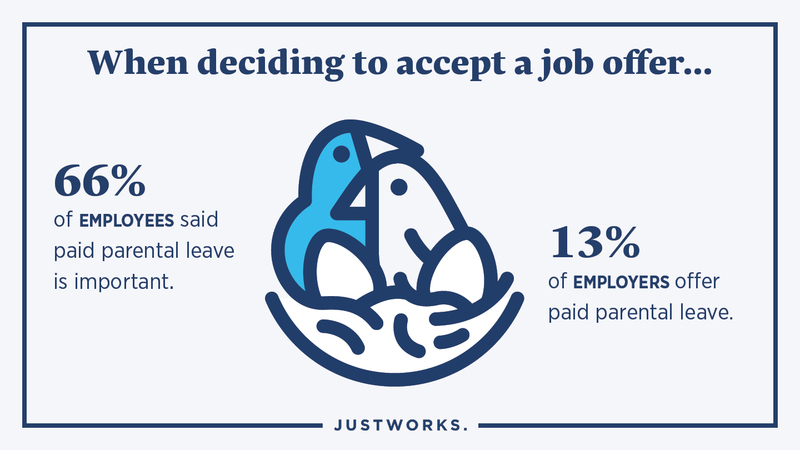 In contrast, only 13% of employers offer paid parental leave in their benefits package. 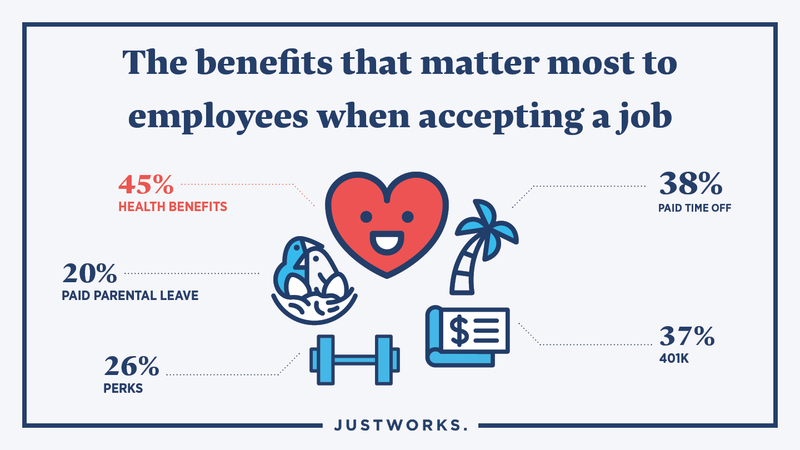 If you own or run a growing business, it may not be possible for you to offer all these desired employee benefits right away. But making long-term investments in your team will pay off in all areas, from recruitment to retention to productivity. Think about what incremental steps you can take toward achieving that goal. 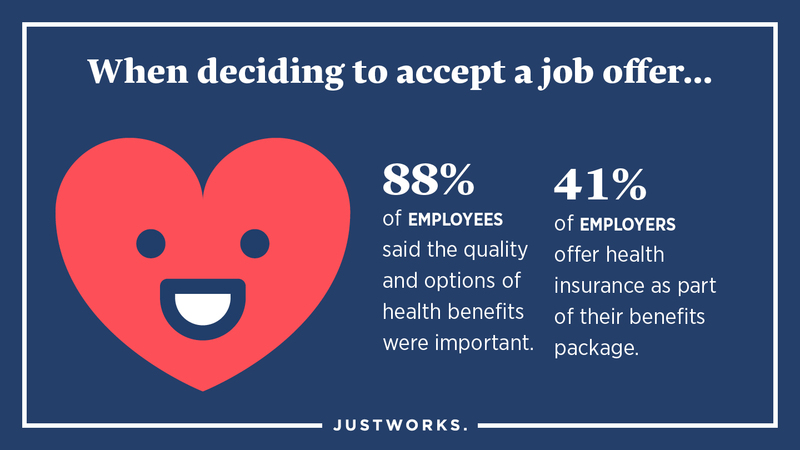 Justworks understands the challenge of finding access to quality, affordable employee benefits. When it comes to negotiating rates for health insurance, there’s power in numbers. As a PEO, we use our group’s buying power to secure plans and prices usually only available to large corporations. Why? Because we believe you and your team deserve them, too. You can learn more about us here. *From a 2017 study of 521 employees at U.S. companies sized 2-200 employees, who do not use Justworks’ services.